Eustace, I really like the gown, I think it would look better in a pale green, a veeeeeeeery pale green, or blue. I just LOOOOVED the Midnight Tiara, I mean it is exactly what I imagined, but I couldn't quite find it. Wow, it's just perfect! I think something like this would be great for the hunting dress when Lilliandil dies. Eustace and De_De, both of the dresses you posted are quite pretty and I think they'd be good inspirations. I'm not quite sold on the colours on either of them, though----I'm still thinking light or bright colours. De_De, good point about showing that she's completely adapted to human life (...unless they want to go the other direction, which would stink )! Drawing on what wagga said earlier about the elements and her burial, do you think they'd want to show a strong connection to the earth (as opposed to the sky or sea) with, say, browns and greens, or just to Narnia with, emm, whatever colours Narnians are wearing (maybe some red and gold accents?)? Just tossing some ideas around here---throw them back as interested. I couldn't see the necklace however I love the crown and dress you've posted Meltintalle. I can already see Lilliandil getting crowned with it and marrying Caspian in that dress although I would love to see it longer, but the coloring is perfect for the star's daughter and I love the trimming and the bare shoulder length and, and... I want to go on but the more I look at the picture the more I want this dress. haha. Still very perfect for RD. Why, thank you, Damsel! To be honest, I'd forgotten I'd posted it. But I quite like it (still? again?) for Ramandu's daughter and I agree on the length. However, I wonder if those might be a bit too grand. While there's a reasonable chance that we might see her in her finery during funeral proceedings, I would imagine that it's more likely we'll see her in something like this during the maying. I do hope that her Narnian gowns look subtly different than those of Susan and Lucy, though. Perhaps more shimmering, luminescent fabrics, though nothing over the top, of course. I know I'm double-posting, but I ran across this dress the other day on Google and it made me think of something that Ramandu's Daughter might wear as her wedding gown. Obviously, I think it would need to be a bit more ornate and queenly, but I like the shoulder detail—it's a nod towards her original, sleeveless style without sacrificing the grandeur of flowing sleeves. Paired with a long veil of lace and a delicate, starry crown, I can easily imagine Lilliandil dressed as such while standing at the alter with Caspian. Hopefully we'll actually get to see a glimpse of that scene in the film; I can imagine that they could show it during the flashback scene at the Parliament of Owls. Reading your post I suddenly started to wonder: would it be weird for the daughter of a star to wear star representations in her hair? Would stars have some sort of cultural taboo about that? ...never mind, it's a great idea and I'm overthinking this. Lol! That's a funny thought. It would be strange, though, in a way, because they think of stars as being people, not little multi-spired shapes. I can also imagine her wearing a garland of flowers in her hair on her wedding day... perhaps some of these lovelies. Still, she would probably need a crown, and since Susan and Lucy had flowers in the designs of their crowns... maybe silver fireflowers? The only problem with that is nobody know what a fireflower looks like. The Rose-Tree Dryad wrote: Lol! That's a funny thought. It would be strange, though, in a way, because they think of stars as being people, not little multi-spired shapes. Haha! That's brilliant. I'm never going to read those passages about fireflowers the same way ever again. De_De wrote: EustaceI think something like this would be great for the hunting dress when Lilliandil dies. I like that one, but I think I like "The Accolade" (based on a painting by Edmund Blair Leighton of the same name) better, or the Rowena dress. I love velvet, and spring in the north can be a bit chilly. 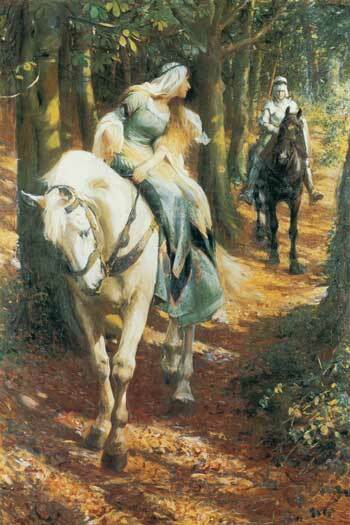 Here is a painting by John Collier called "Queen Guinevere's Maying"
I usually imagine RD looking like Hudson Talbott's illustrations of Guinevere.